Wildeboer Updates IBU EPDs | Institut Bauen und Umwelt e.V. 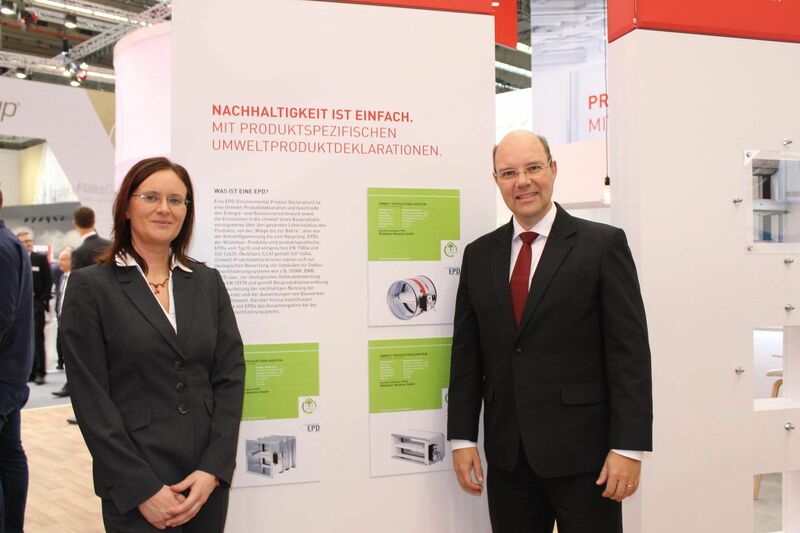 On 11 March at the ISH trade fair in Frankfurt, the Institut Bauen und Umwelt e.V. presented the Wildeboer Bauteile GmbH company with three environmental product declarations for its fire dampers. This constituted a repeat performance, as these declarations were actually updated, re-verified EPDs being renewed by Wildeboer, a building services product manufacturer headquartered in Weener, a town in Germany’s northern coastal East Frisia region. More than five years had elapsed since Wildeboer first created its environmental product declarations (EPDs) for three different fire dampers. These were published by the Institut Bauen und Umwelt e.V. (IBU) in November 2013, making Wildeboer not only the first manufacturer from the building services engineering sector to participate in the IBU’s EPD programme, but also the first company worldwide to provide life cycle assessment data for HVAC components. According to IBU Managing Director Dr Alexander Röder, even though technical building services have an enormous influence on the environmental impact of a building during its use phase, there is notably still far too little life cycle assessment data available from the building services engineering sector. “We are therefore all the more delighted that Wildeboer is not only pioneering this effort, but that they are also ensuring that the data they provide remains updated and available”, reports Röder. EPDs are valid for a period of five years. After that, for the declarations to continue to be published by the IBU, the data they contain is required to be reviewed for any necessary updates or corrections and then be re-verified by independent experts. Dr Jana Panaskova, who holds key responsibility for sustainability and energy management at Wildeboer, was presented at the ISH with the renewed EPDs for the FR90, FK90 and FK90K fire dampers. “What sets our products apart is their maintenance-free design and the contribution they make to the energy efficiency of a building”, explained Panaskova. “Since EPDs document the environmental impact of the entire life cycle of a product, we can use them to provide information about exactly those features of our products, based on data from existing life cycle assessments”. Panaskova added that EPDs have now become an integral part of the work at Wildeboer: “Along with the EPDs for fire dampers, we have also created declarations for smoke control dampers as well as for volume flow controllers and limiters”. Every Wildeboer EPD also conforms to the standards established by ECO Platform, the umbrella organisation for a number of national EPD programme operators within Europe, allowing the EPDs to be recognised by many other European countries and to be made freely available to all interested parties. In addition, the underlying life cycle assessment data is stored and can be accessed in ÖKOBAUDAT, the online building materials database maintained by the German Federal Institute for Research on Building, Urban Affairs and Spatial Development (BBSR). By making reliable environmental information available in a standardised form, Wildeboer is making an important contribution to sustainability, enabling all stakeholders in the building process to have access to information they need for the planning – and the evaluation – of sustainable construction projects.